Luxurious velvet and dazzling sequins make this short holiday dress an eye-catching style for seasonal festivities. 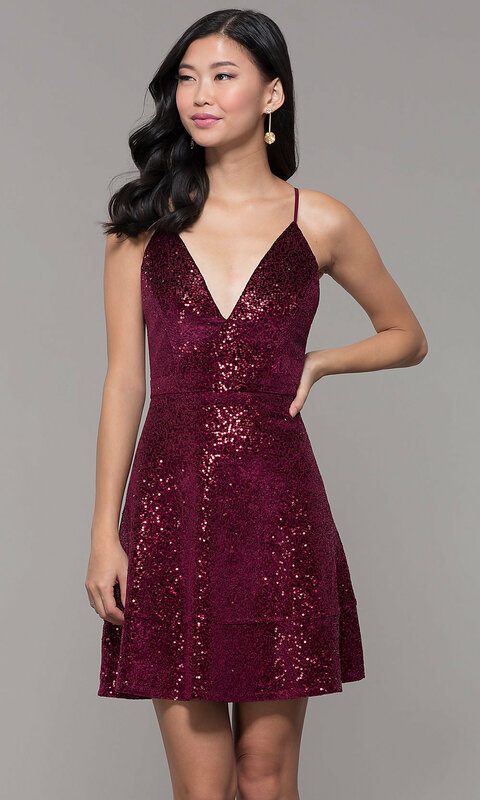 In deep wine red, this figure-flattering party dress is also ideal for Valentine's Day dinners, New Year's Eve celebrations, and Christmas parties. The v-neck bodice features adjustable spaghetti straps that drape over the shoulders and attach at the beautiful lace panels that top the triangular cut out in back. 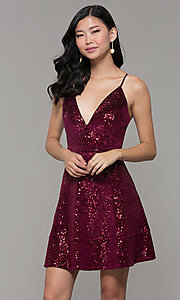 A sparkling sequined short a-line skirt completes the look of this stunning short holiday party dress, under $100, that is sure to draw admiring eyes at your next semi-formal event.